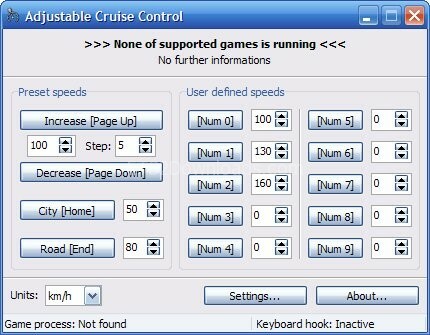 This tool for Euro Truck Simulator 2 will help you adjust your cruise control speed, increase or decrease the current Cruise Control Speed. It will run in background while you’re playing ETS2. View the readme.txt for more information! First, you need to download 2 things above, then install the program. Extract GamesData.ini from the update archive. Paste the new GamesData.ini that you’ve extracted before into “Bin” folder in the installation directory, replace it! It is the author’s original link. I don’t have permission to reupload it. I would ask you to please to do it .